Renowned golf course architect Ken Moodie and his company Creative Golf Design has been working with us to manage a re-design of all our bunkering and to improve the course. 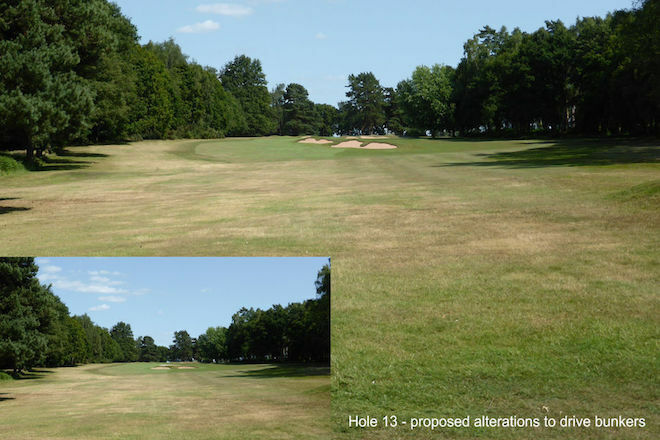 Works have now been completed on 13 holes and we plan for the rest to be finished by 2020-21. Shown below left is the beautiful Par 3 12th after the redesign in 2016. Born in Scotland in 1965, Ken started playing at an early age. He studied at Heriot-Watt University in Edinburgh and gained a BA Honours degree in Landscape Architecture in 1988. He joined the golf course architectural practice of Hawtree & Son in 1989 and established his own firm in 1998. Ken is a Senior Member and Past President of the European Institute of Golf Course Architects. During a period of over 25 years in golf course architecture Ken has been involved with a wide variety of projects throughout Europe. He has worked on over 20 new golf course developments and advised more than 60 golf clubs on course improvement work, including two Open Championship venues and a number of Open qualifying courses. His new course developments include the Millennium Golf Course in Vilamoura, Portugal; a PGA European Tour standard course at Wychwood Park, Crewe; and a new 18-hole championship links course for the Marine Golf Club on the island of Sylt, in Germany.